When it comes to PC audio peripherals, it is fair to say that it is a highly competitive market. The established premium manufacturers tend to have a monopoly on consumers, attracting the lion's share of the consumers' wallets. On the other hand, up and coming budget companies often don't have the quality nor brand power to push through and succeed. 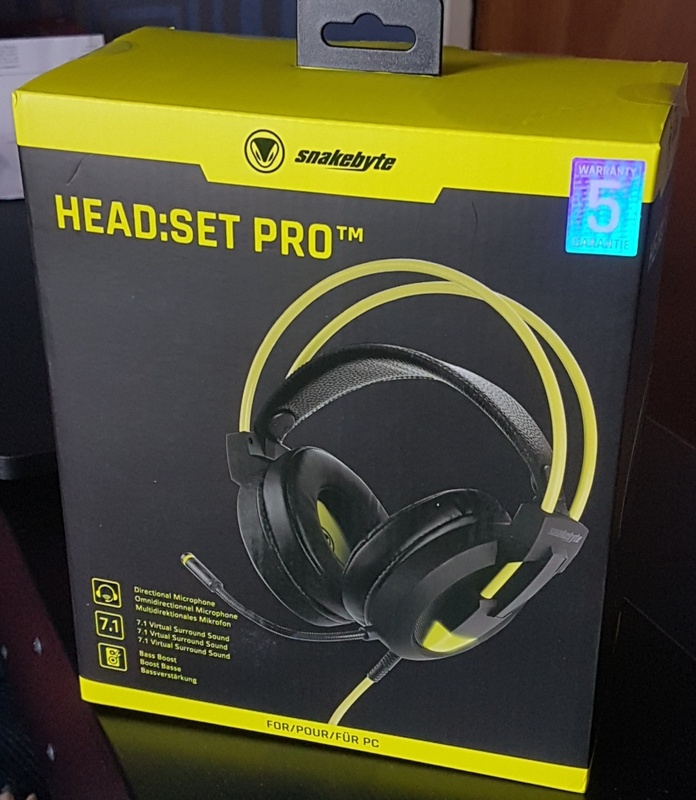 The new Head: Set Pro from Snakebyte attempts to address this unbalance with a new 7.1 virtual surround sound headset, which strives to bridge the gap between quality and cost. Snakebyte are a relatively new company on the scene. They set up in Germany in 1997 and have a diverse portfolio of products across all the major gaming systems, as well as other media devices and drones. The Head: Set Pro improves upon its entry-level predecessor of last year. This time around, it is packed with more power as well as more distinctive aesthetics. The headset comes with 50mm drivers, with over-the-ear foam ear cups and an attached volume control. It also features optional bass-boost and a directional and fully rotational microphone. All of this is connected via USB, so the pleasing thing for most users is that they can plug-in-and-play. With any gaming headset, one of the main considerations must be comfort. Gaming sessions on PC are often intense affairs, and many players lean towards medium to long sessions. In this regard the Head: Set Pro is perfect, since its ear cups are cushioned well enough to fit snugly over the ears, whilst also delivering the passive noise cancellation promoted. Settling in to a four-hour stint of Assassins Creed, it doesn't even feel like a device is being worn. This is also helped by the support arch that fits around the top of the headset and supports the rest of the device. Being sturdy but also comfortable is a winning combination. Obviously, the noise cancellation is not active and so there is some noise that gets in from outside sources as well as some leakage from the set itself. With that said, it isn't a problem and the power of the sound in the ear means any outside distractions are far from noticeable anyway. The sound quality on offer from the Head: Set Pro is incredibly impressive. The clarity on all the details within a game is exceptional. The wind blowing, gun shots in the distance, booming explosions are all clearly distinguishable, sounding clear and crisp. Now, obviously this headset is designed to be a more budget friendly option than some of the premium contenders in the market. Therefore, some of the top end frequencies are a little dull, and whilst the bass is generally good, it can be a little over the top at times. There wasn't a noticeable difference when using the bass-boost feature, however, but this may well be game dependent. Where the Head: Set Pro lets itself down, slightly, is in some of the design choices. This isn't such a big deal since it is not a product likely to leave the home. It is clear, however, that Snakebyte have adopted the approach of some of their rivals in the market, by committing to a very distinctive look to their products. This is achieved through using lots of primary colours, LEDs and sharp edges. There's always a balance to be struck with this style. Go too far and it looks a little childish. 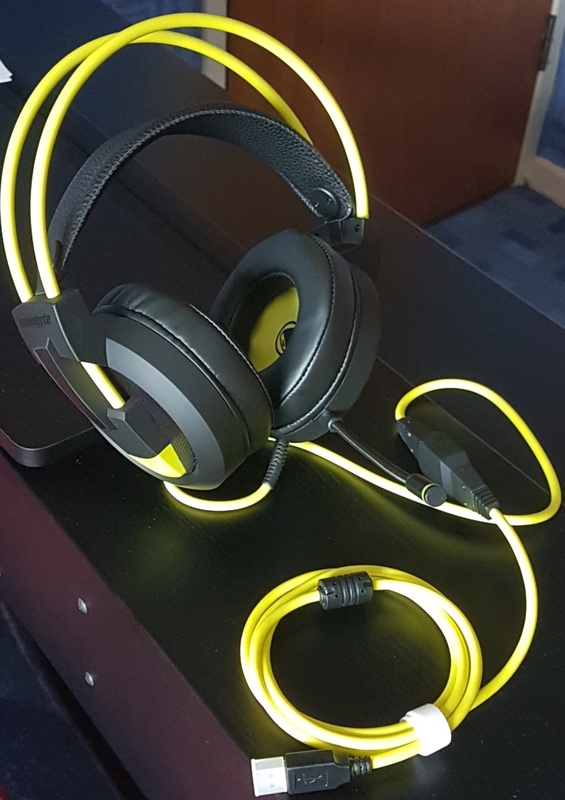 Thankfully, the Head: Set Pro never goes that far, with a measured yellow and black aesthetic and LED lights on the base of the ear cups. It does look like a stylish and premium product for the most part and certainly more than matches some of the much more expensive alternatives. One drawback, though, is the chunky cable. This can be slightly irritating at times, since it can easily get caught up on objects, which can become a distraction when sitting on the leg or arm of the user. Finally, of course there is the permanently attached microphone. It is straight-forward to rotate it, and alter it in any direction. Better still, the microphone sticks to the chosen position without any issues. This is great, considering how many headsets have annoyingly and awkwardly placed microphones, which really limits the enjoyment one can get from the product. Another great feature is a light around the end of the microphone, which indicates whether it is on or muted. This is a small thing but it is another neat touch, that Snakebyte wisely included to improve ease of use. The quality of the communication is decent but not amazing. Certainly, the clarity of voice is there in the microphone, but there was a noticeable amount of background noise that came through when tested with a lot of outside noise. The majority of the time, however, it's perfectly serviceable for all the typical multiplayer experiences. Considering its billing as a more affordable crack at higher-end audio quality, the Head: Set Pro does a great job. The 7.1 virtual surround sound captures all the details in games and the level of comfort when wearing it for extended periods of time means that it achieves the most important job of any headset - to enhance the immersion from gaming experiences. Whilst it goes over the top slightly in trying to be a distinctive-looking product, for the most part it looks sleek, stylish and sturdy with a microphone that does a good if not spectacular job at capturing chat. Coming in at under £40 it is certainly affordable, and priced exactly in the right space for what it is targeting. As a low to mid-range headset, it is hard to think of a better option.